If you’re looking for a taste of real Greece, Agios Sostis (Aghios Sostis) is a great choice. 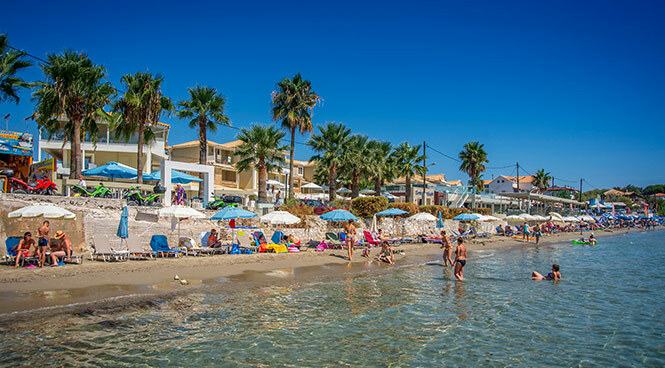 There’s a small sandy beach with traditional tavernas lining the waterfront and views across the crystal clear waters to Turtle Island – stunning! This dinky resort is perfect for a relaxing holiday with livelier options within a short drive, including Zante Town and Kalamaki.If you’re looking for a taste of real Greece, Agios Sostis (Aghios Sostis) is a great choice. There’s a small sandy beach with traditional tavernas lining the waterfront and views across the crystal clear waters to Turtle Island – stunning! 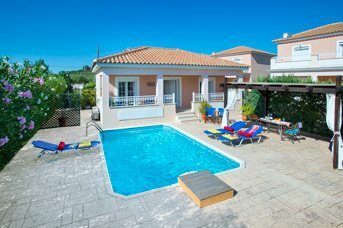 This dinky resort is perfect for a relaxing holiday with livelier options within a short drive, including Zante Town and Kalamaki. This little Greek charmer serves up a couple of mini markets, bakeries and ice cream parlours. And for a wider choice, there’s larger supermarkets within a short drive distance, as well as Zante (Zakynthos) Town, which is 25 minutes by car. A handful of cafes, bars and restaurants line the coastal road of Agios Sostis, overlooking the beach. The resort may only be small but there's still a good choice of local tavernas, offering a true Greek dining experience, including traditional Greek dancing, plate smashing and live Greek music! There is a small but well-formed sandy beach in Agios Sostis, with shallow crystal clear waters, which is great for families. You'll also have a fantastic view across to Cameo Island and Marathonisi (Turtle) Island. Cameo Island can be accessed via a footbridge from the port of Agios Sostis. By day, there is a relatively chilled vibe at this small beach and by night, this place comes to life! The Bay of Laganas is also just a 5 minute drive away, which is one of the best stretches of sand on the island. With the exception of pedaloes, you won't find any watersports in this area, to ensure the nesting turtles aren't disturbed. Your best chance of seeing one of these beautiful sea creatures is between July and August. Agios Sostis is a great choice for families looking for a quiet and relaxing holiday. You can enjoy a stroll along the beach while turtle spotting, building castles in the soft sands or enjoy an ice cream while watching the world go by. Some of our villas are within walking distance of the resort centre, so it’s not essential to hire a car. Life in Zante revolves around the Ionian Sea, with a wide choice of boat excursions available from the port in Agios Sostis. Whether you fancy visiting the shipwreck at Smugglers Cove, or cruising the crystal clear waters in search of the famous loggerhead turtles, there’s something for everyone. You can even hire your own private boat to explore the island including a stop of for a swim in the Blue Caves!